Steampunk Costumes and Costume Accessories for Steampunk World's Fair 2013! Steampunk World's Fair, returning to New Jersey for it's fourth year offers a great opportunity to flaunt your steampunk inspired costumes. Spread over the weekend, from May 17th to May 19th, the event promises a host of parties, mixers and the likes. It is THE place to showcase your love for the streampunk genre and subculture. You can dress up in Steampunk, punk and Victorian Themed Costumes for the numerous costume balls that the event promises. We've a range of Steampunk Costumes and Costume Accessories that will make sure that you've a memorable time at the fair. From Victorian style dresses for women to American Western Steampunk clothing for men, the variety is truly endless. Let's take a look at the costumes for the women. From Victorian style outfits to fantastical Victorian Vampire Dresses, the women have a lot of variety to choose from. These beautiful dresses and costumes will make sure that you stay true to the theme without comprising on the looks! This beautiful wine shade dress is perfect for a Steampunk themed dance. The costume includes an ankle-length dress, a corseted jacket with an attached bustle, a coordinating cravat and a headpiece – both with cameos attached. Classic black never fails to impress and neither does this stunning Victorian Lady Costume. The petite jacket is figure hugging and the ruffled skirt adds an air of elegance to the full outfit. This costume includes jacket and skirt. Forget the pretty and shiny vampires of Twilight! Who can forget iconic vampires such as Angel, Spike and Drusilla? They entered our hearts from the moment Buffy the Vampire Slayer aired on TV screens. The Victorian style dresses worn by Drusilla and other female vampires have become part of Steampunk culture. Therefore it is only fitting that you should go to the Steampunk World's Fair, wearing this Victorian Vampire Costume. This costume includes a Dress, Cape, Neckband, Boot Covers, Fingerless Gloves and Goggles. It is also available in plus size. Costume Accessories help to transform a simple costume and make it extraordinary. To make your outfits look extraordinary, you can go for a variety of Steampunk inspired Costume Accessories. You can go for figure-enhancing corsets or pretty jewelry, to name a few. Corsets help to give a more desirable shape to the body and that is why they were an integral part of Victorian fashion. You can accessorize you Victorian Dress with this Steampunk Inspired Corset. This one lace up boned corset comes with Velcro closure in the back. Necklaces especially metal chokers were quite popular during Victorian times. 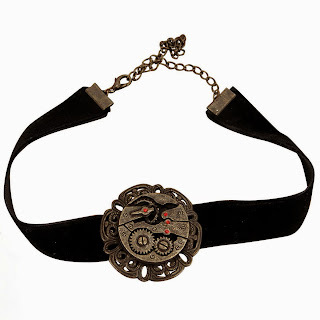 This choker necklace features a gear design, the gear machinery being synonymous with Steampunk culture. Therefore, it makes for the perfect costume accessory for Steampunk World's Fair. 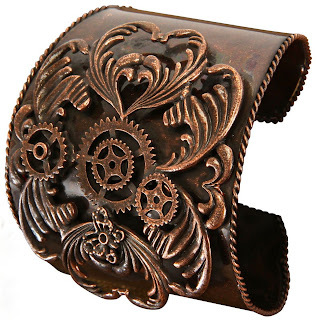 Featuring gear wheel designs, this Antique Copper Bracelet would complement any of the aforementioned Steampunk costumes for women. This metal bracelet will definitely add a touch of authenticity to the overall attire. Coming to the men, you need not worry! 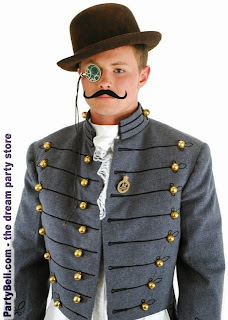 There is a whole range of men's Steampunk costumes to choose from. Duster coats, Steampunk inspired trench coats and of course Victorian Vampire costumes, are a few of the popular ones. Dusters are long coats worn by horsemen and have become part of American Western Steampunk fashion. This costume includes the coat only. Trench coats, from first being seen in sci-fi hits like The Time Machine have firmly embedded themselves in Steampunk fashion. This costume includes a trench coat and boot covers. Inspired by Angle and spike from Buffy the Vampire Slayer, Victorian Vampire costumes make for the perfect Steampunk costumes. This Costume includes a Coat, Vest, Hat, Boot Covers, and Goggles. It is also available in plus size. Just like with women, there are a whole range of Costume Accessories available for men. Steampunk hats, watches and goggles are some of the few accessories that you should look for. 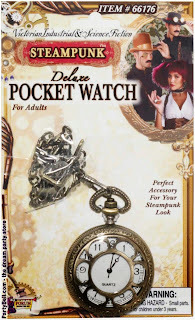 An antique looking pocketwatch with chain will look great with both your trench coat or duster coat costumes. It gels well with the American Western Steampunk culture and as such would make for a great costume accessory. Featuring a hat, moustache and monocle, this Accessory Kit is a great and economical way of dressing up for the occasion. All 3 (hat, monocle and moustache) can be added to your Steampunk costume attire. Goggles, as seen in several cult sci-fi movies, can be the final touch to your costume. 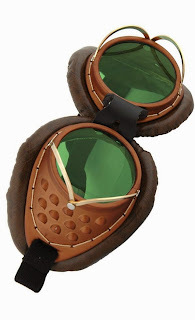 These goggles complement all the male Steampunk costumes. The Steampunk movement and culture has inspired a lot of people and this Worlds' Fair allows to you express your love and gratitude for the same. So, make the effort and dress up for the occasion. You will've that much more fun, this we can promise!